Remarks: GSK2256098, also known as GTPL7939, is a focal adhesion kinase-1 (FAK) inhibitor with potential antiangiogenic and antineoplastic activities. 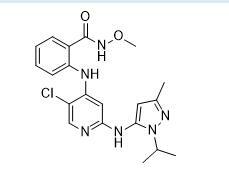 FAK inhibitor GSK2256098 inhibits FAK, which may prevent the integrin-mediated activation of several downstream signal transduction pathways, including ERK, JNK/MAPK and PI3K/Akt, thereby inhibiting tumor cell migration, proliferation and survival, and tumor angiogenesis. The tyrosine kinase FAK is normally activated by binding to integrins in the extracellular matrix (ECM) but may be upregulated and constitutively activated in various tumor cell types.